UPTOWN — 3-D printing is coming to Walt Disney Magnet School, where officials said the booming technology will teach students cutting-edge skills — and how to improve people's lives. Disney, an elementary school at 4140 N. Marine Drive focused on technology and fine arts, has about 1,650 students and is considered one of Chicago's best schools. Officials there are preparing to order about $40,000 in equipment to build a "Makers Lab," which incorporates 3-D printing technologies and will open in about three months, according to Disney technology coordinator Brad Fisher. "The potential for this technology is tremendous," Fisher said. 3-D printing (or "additive manufacturing") is the process of composing a solid three-dimensional object from a digital model. The technology has been around since the 1980s, but in the past few years has become more widely available commercially. Companies such as General Electric have used 3-D printing to make turbines. Others such as Nike and New Balance have used it to design prototypes for shoes. And scientists and doctors have used 3-D printing for human prosthetics, with some researchers' eyes on the possibility of printing human tissue. Fisher and Disney Principal Kathleen Hagstrom said the vision for the Makers Lab and its curriculum is still emerging, but they already have one big project in mind: Disney would like to partner with a school that has a population of blind students to help them learn braille. Disney students would design and print objects in shapes that correspond with the name of the object, which would be printed on the object in braille so that blind students can use their sense of touch to learn words. Hagstrom compared it to teaching a child a new word by packaging the spelling with a visual representation of the word. "We envision our students engaging in projects that are going to make the world a better place, that are going to improve the lives of people," Fisher said. 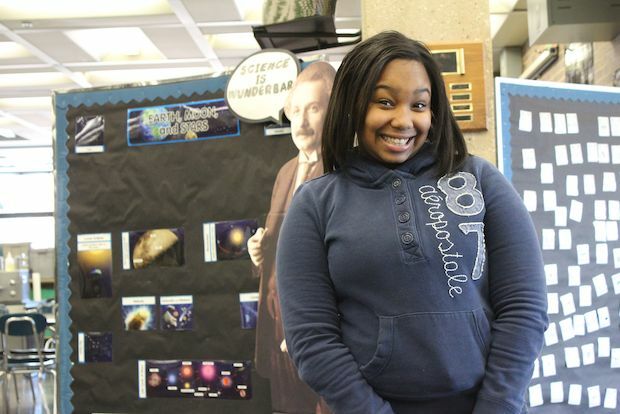 Sixth-grader Stone Brown of Bronzeville is a fan of Disney's tech-centric approach. "We get to learn new stuff, and when we do learn new stuff it's interesting, it's never boring," said the 12-year-old, who also expressed excitement over the Makers Lab. Stone said she hopes to one day have a career in fashion design, a field that is using 3-D printing more and more. Her science teacher, Andrew Russell, who will give lessons in the Makers Lab, compared the lab to a child's lemonade stand, calling it "entrepreneurship that lets kids create something instantly." "We always talk about our kids and say, 'You're going to do something in this or that,' but we always say — 'You're going to', whereas here, it's 'You're going to — right now,' and this is an exciting time in science for that," he said. The Makers Lab is slated to be installed in a third-floor room and share space with a science lab. Disney has a deal with technology manufacturer Inventables, which is providing the printing hardware, helping set up the lab and offering Disney advice on how to set the lab up. Fisher said much of the funding for the Makers Lab comes from revenue Disney gets by renting out its building and parking lot — revenue streams he credited Hagstrom for tapping. "Dr. Hagstrom has a very strong head for business and cutting deals, and I say she has the skill set to run a Fortune 500 company," Fisher said. "She's been able to find ways for this school to generate revenue that has allowed us to implement some of these programs that are benefiting our students." It was Hagstrom's chance encounter with Diane Disney at a small luncheon at the East Bank Club 10 years ago that spurred a friendship between the women — and helped the school establish a relationship with someone who became its biggest benefactor. Diane Disney, the recently deceased daughter of the school's famous namesake, contributed more than $700,000 to Disney programs before she died in November, including money that funded a $250,000 animation lab and a $100,000 digital media lab. "There is no question we do not just rely on Chicago Public Schools funds," said Hagstrom, who mentioned she is looking to partner with more companies to boost the Makers Lab initiative. "You have to be creative with how you get money for your school."